We incorporate many outdoor water features into our landscape design and pool landscaping on Long Island NY. Swimming pool waterfalls, Koi fish pond construction, garden water fountains and other water features, just to name a few of the many outdoor and backyard water features we install. Incorporating water into garden and swimming pool design has been continually refined for many decades. From modern swimming pool design to natural ponds and stream installations, our Long Island water features are elegant, and inviting. Gappsi's creative landscape designers can bring the element of water into your outdoor or backyard living space, with the addition of beautiful fountains, swimming pool waterfalls and wall water features. Our knowledge and expertise in masonry, swimming pools and landscape design on Long Island can help inspire water feature and pool landscaping ideas. We understand how to keep balance and scale in adopting the right water feature for your landscape setting. 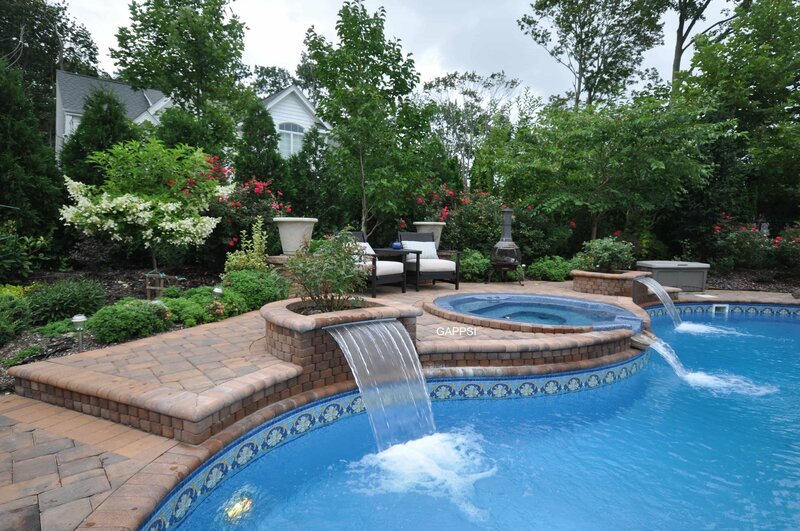 Call Gappsi for a pool landscaping and water feature consultation at (631) 543-1177. Water Fountains: There are many options for outdoor water fountains.Water fountains come in many shapes, sizes and style. They can go on walls and waterfalls; they can feature decorative toppers, and can be spherical and tiered. Fountains can be used to accent your garden, backyard or patio. They can also be placed in an outdoor pond. Fountains can be a great addition to your landscape. Waterfalls: Waterfalls are a great way of bringing ultimate aesthetic appeal to your swimming pool or outdoor area. Waterfalls come in a variety of choices, including materials and sizes. Outdoor Ponds: Ponds come in a variety of choices and options. Size, pond location and electrical connections are all serious considerations when choosing a pond installation. Another consideration is if the pond we be used for fish, tropical plants or purely aesthetic. Rock Ponds and Gardens: Rock ponds use various types and size buolder to help accent any space. Running water over these rocks is the preferred choice, offering a pleasing and visually appealing appearance. Hot Tubs & Spas: Hot tubs and spas are a great addition to any swimming pool, offering cascading waterfalls into your pool, as well as other water features. 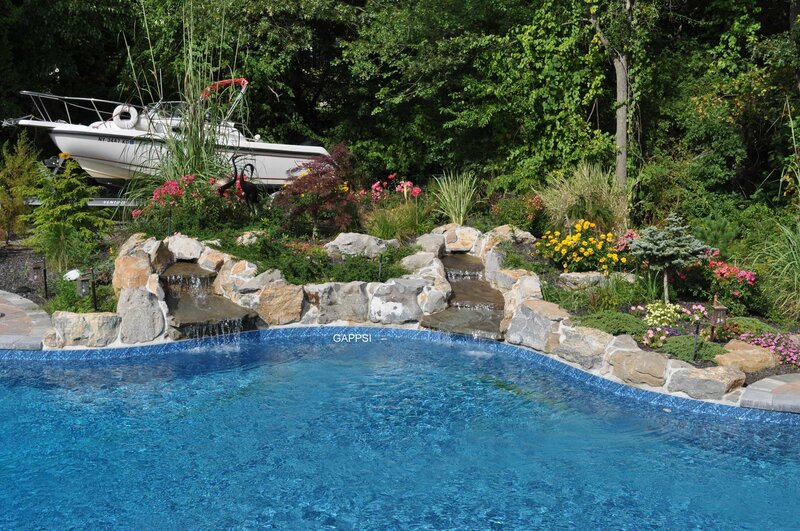 Gappsi has over 25 years experience on Long Island installing and designing water features and pool landscaping. Call us today for a design consultation at (631) 543-1177.